To reduce the likelihood that a front passenger may be injured by an inflating side airbag, the passenger side airbag is automatically turned off when: • The height sensors detect a child or short-statured adult is seated in the front passenger seat. 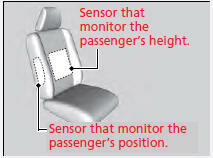 • The position sensor detects that the front passenger is leaning into the deployment path of the side airbag. When the side airbag cutoff system is activated, the side airbag off indicator comes on.